Mode’s third volume of Scelsi focuses on chamber music for clarinet, flute and oboe, definitive performances all. Clarinettist Carol Robinson, who worked with Scelsi in the 1980s, is the major force behind this recording. A special treat for Scelsi fanatics is the inclusion of a photo of the Roman forum taken from the oddball composer’s apartment. I especially enjoy this recording’s immediacy. The Suite’s flute and clarinet will be there in your living room. This surprisingly conventional duet has the flute and clarinet frolicking together like bubbles in a fountain. The opening hints at something bucolic, even Mahlerian (think Third Symphony). Bounding ahead 13 years to another flute and clarinet duet, Ko-Lho, Robinson and flutist Novakova play as one, with teasing and insistent microtones, flutter-tonguing, multiphonics, and passionate phrasing. These two duets alone demonstrate Scelsi’s variety: the expressive, traditional melodist vs. the avant-garde sculptor of single-tone music emphasizing timbre and color. Flute alone revels in Pwyll, a short, acrobatic piece. Some of Scelsi’s titles, such as Ko-Lho, are pure inventions, but there is a Pwyll in Celtic mythology. Scelsi’s Pwyll revolves around several pitches and a limited set of modal harmonies. Rucke di Guck, the third duet, a raucous and busy set of three emphasizing the instruments’ shrills and piercing qualities is scored for piccolo and oboe. If I remember correctly, ‘rucke di guck’ is a taunting refrain sung by birds in a Brothers Grimm fairy tale. There are four works for solo clarinet: Ixor, a tiny gestural invocation that bounces out of a few repeated notes; Preghiera per un’ ombra, a cry of suffering and rage at the death of a loved one; the virtuosic Three Pieces for E-flat clarinet; and Three Latin Prayers, originally composed for voice. Scelsi is a gifted composer of melodic lines, and his music empowers performers to tell a story or target an emotion. Robinson gives the Three Pieces a dramatic edge, and the latest composition, the Three Latin Prayers (Ave Maria, Pater Noster and Alleluja), is buttery and wistful. The quality of performances and recording sweeps aside other releases. Modern Italian classical composer Giancinto Scelsi was a difficult and demanding critic of those who made the effort to try and play his challenging music. He was partial to women musicians and worked closely with a number of them, to help them understand his music and play it just right. Clarinetist Carol Robinson worked with Scelsi in the early eighties in Rome where he lived and composed. Oboe expert Cathy Milliken plays in the renowned Ensemble Modern where she worked with Frank Zappa, Fred Frith and Stockhausen. Czech flute and piccolo wonder Clara Novakova currently plays in Ensemble Orchestral de Paris and Trio Noblis. 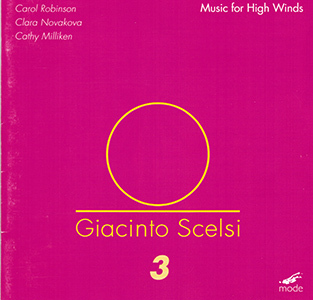 Music for High Wind features all three of these talented women musicians doing solos and duos with works by Scelsi composed between 1953 – 1970. Ixor (1956) for solo clarinet is stark, poignant and concentrated. Suite (’53) is for flute and clarinet and is in four parts – both players exchange ideas quickly, the flute over-blowing breath-like sounds early on, in the second part the clarinet plays short phrases as the flute flies around, connecting at odd points; the third part starts to move more quickly as both flute and clarinet complete each other’s lines, connecting in unexpected moments; the fourth part has the clarinet & flute doing more melodic and playful things. Preghiera per un’ ombra is another solo clarinet work (from 1954) which has Carol beginning to move quickly and the notes are even more quirky and sharp, more expansive and more colorful, yet still calm and reflective in spots – about half way through the music becomes more intense and dances more quickly around a theme – finally winding down to a more austere ending. Ko-Lho (1966) is for flute and clarinet and is in two parts. Both players must expand their sound and play some denser drone-like phrases like insects buzzing an eerie haze, in the second section the drones expand even more – appearing, disappearing, reappearing. Pwyll (1954) is for solo flute – playful, yet shrewd, a central phrase is repeated in different ways, somber in parts, droning mysteriously in other parts. Tre pezzi (1954) for solo e flat clarinet in three parts presents a few notes which bounce between themes; the second part has a more forceful and an almost electric current which ignites the tension and the third part back to some sharp yet stark flames which for higher ground as the notes are bent slightly upwards. Rucke di Guck is for piccolo & oboe and both players work with higher and even sharper notes which dance more quickly as they rub against each other igniting sparks, getting more intense as they move faster into a more dense cloud. The final work is Three Latin Prayers (1970) for solo clarinet once more – the most elegant and restrained piece here, the notes are smoother, warmer and have that nice wooden tone. There is something haunting, restless and often provocative about the spirits found within this music – listen closely, so the muse and the listener can be set free. […]Among Mode’s discs, the best entry point is “Music for High Winds”. Clarinetist Carol Robinson worked intensively with Scelsi during the 1980’s. Her impressive disc gives us the Scelsi parallel of Pears singing Britten. Then I would turn to Toronto pianist Stephen Clarke’s performance of Action Music (1955), a piece that synthesizes what Scelsi achieved for the piano. “Orchestral Works” stretches, literally, what can be done with power of the big instrumental beast that we’ve inherited from the nineteenth century Romantic tradition. It also includes striking samplings of Scelsi’s writing for voice. The solo clarinet version of Three Latin Prayers (1970) on “High Winds” announces phase four of Scelsi’s compositions, reworking tonality into his three-dimensional system. The clarinet sounds classically gorgeous and yet unfamiliar, as does the stately but varying tempo. All but two of the works on this disc date from between 1953 and 1957 (the exception being Ko-Lho from 1966 and 1970’s Three Latin Prayers), but while his younger contemporaries Boulez, Stockhausen and Nono were still thrashing out the ideology of total serialism and agonizing over whether to include Cageian chance procedures in their work (they eventually did, but ended up excluding Cage himself), Count Giacinto Scelsi had gone way beyond the confines of dodecaphony and arrived at an utterly unique, intuitive and inspired compositional aesthetic. […]Though perhaps best known for his extraordinary orchestral meditations on single pitches (‘drone’ is far too static a noun to describe his work), Scelsi’s writing could be extraordinary playful and light when he wanted. In later life, Scelsi worked closely with his interpreters – clarinetist William Smith introduced him to certain microtonal inflections in the 1960s (used to great effect in Ko-Lho), and Carol Robinson, the performer here, worked with the Count during the final years of his life. Her readings of his works are authoritative and utterly convincing, as are the contributions of flutist Clara Novakova and oboist Cathy Milliken. While many of the pieces played at Darmstadt back in the fifties now sound hopelessly dated and dusty, these magnificent little vignettes are fresh enough to have been written yesterday. A l’époque où l’avant-garde européenne s’employait à imaginer une musique anguleuse ot discontinue, Scelsi, sans être moins novateur pour autant, ne rêvait que de retour circulaire et de transitions lisses. Dans ce troisième volume de l’anthologie consacrée au compositeur par l’éditeur américain Mode, ce défi est d’autant plus captivant que la manière qu’avait Scelsi d’imaginer le son semble à première vue contradictoire avec la technique et l’écriture des bois. Aux pédales et glissandos microtonaux qui font la spécificité des quatuors de Scelsi répondent ici les unisons qui bifurquent dans Ko-Lho, les intervalles à la fois purs et estranges de Three Latin Prayers, et surtout les motifs non tempérés qui tourment sur eux-mêmes. Déjà, dans Preghiera per un’ombra (1954), le compositeur affirme sa volonté d’imposer un nouveau statut de l’ornement. Le détail a une importance particulière chez Scelsi. C’est ce qu’ont compris la clarinettiste Carol Robinson (Ixor devient dans son interprétation le terrain des suggestions obscures, codifiées par le spectre sonore) et la flûtiste Clara Novakova, grâce à la clarté des intentions et à la luminosité du timbre.